A police officer who stole 10 ancient gold coins he found with a metal detector has been jailed for 16 months. 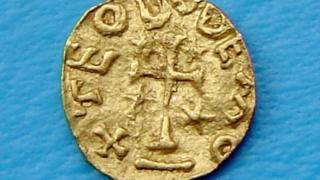 David Cockle, 50, found the Merovingian Tremissis coins in a famer's field in west Norfolk and sold them for £15,000. He had entered into a contract with the landowner to split the proceeds of any find down the middle but failed to tell the farmer of his discovery. Judge Rupert Overbury, sentencing, said Cockle's motivation had been "pure greed". Cockle, from Leigh, Greater Manchester, had admitted theft at a previous hearing. Three counts of converting criminal property will lie on file. Cockle, who had lived in Wareham at the time, also failed to tell the coroner. Instead he had sold the coins for £1,500 each in smaller parcels of two, three and five coins. Another metal detectorist had discovered 35 Merovingian coins at the same site and declared them honestly. Had Cockle done the same, the discovery would have been the largest find of Merovingian coins in the UK - surpassing the discovery of 37 such coins at Sutton Hoo in the last century, the court heard. Judge Overbury said Cockle had more than 30 years of experience as a metal detectorist and knew the legal process. He added the coins were "extremely rare" and that some of them had never been recovered. Cockle was also banned from metal detecting for five years, banned from owning metal detecting equipment and from entering into agreements with landowners to do metal detecting. He faces five years in jail if he breaches the order. Cockle was dismissed from Norfolk Police last month for gross misconduct.